Tokidoki is one of those slightly weird Japanese cartoon ranges, similar to Pokemon or Hello Kitty that usually spawns a huge range of merchandise, TV shows and maybe even the occasional movie. In this case, pokie developer IGT has grabbed the rights to make a game based around the characters, and perhaps unsurprisingly, it’s full of general strangeness, with flying unicorns, people dressed as cows and cacti, plus dancing cartons of milk. It’s certainly an assault on the senses, which people will either love or hate, but it also comes with a few interesting bonus features that should appeal to just about everyone, including Revealed Reels which shifts entire reels over and can result in players being awarded free spins, multiplier payouts, wild substitutions or just a straightforward bonus prize. With so many features, even though there’s 40 paylines running across the 5 reels, the minimum stake is 0.60, which can be increased to a maximum of 60.00 per spin. The return to player ratio is still between 92 – 96%, as those features are triggered quite often and usually result in some decent wins. 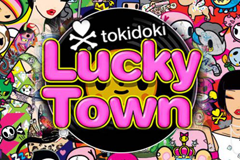 There’s a glimpse of the crazy world of Tokidoki behind the reels, as odd characters and various landmarks including the Statue of Liberty are featured above the main part of the game. The symbols are all related to the theme, as even the playing card 10, J, Q, K and A are decorated with simple drawings of different Tokidoki. In the base game, wins are created by 3 or more of the same symbol type stopping across a line, on connected reels running left to right. The 10 symbol is worth 2, 10 or 40 coins when landing on 3, 4 or 5 reels, but all other playing card symbols are valued at the same level, with 5, 15 or 50 coins paid out. The Tokidoki characters are up next, and while some players may know the names of each one, it’s all new to us, so we’ll just go by descriptions. Someone who looks like they are dressed as a donut is worth 10, 25 or 100 coins when landing across a line, with the cactus and cow valued at a little more and the flying, rainbow-coloured unicorn being the most valuable of the standard symbols at 25, 100 or 300 coins. Any that make up a win will dance around a bit, fly off, or just pull a face, adding some typically Anime style to the game. A skull and crossbones symbol, where the skull has been replaced by a heart, will return wins of 50, 150 and 500 coins, while also acting as a wildcard, replacing others if it can make up winning lines when it does so, and also extending lines across extra reels for bigger prizes. As well as this white on black wild, there’s also a black on yellow version that doubles the value of any line that it completes. But the definite highlight of this pokie are the Reel Reveals, triggered by a happy-looking vinyl record landing anywhere on the right-hand reel. Up to 5 free spins are awarded, but these are not your average spins, as with each, the reels will move one place to the left, revealing new reels and characters from the right side. On the first move, Caramella appears, and this candy-themed character is a wild who will turn up to 3 extra reel positions into further wilds. The second spins sees Truffle, who is some sort of yellow carrot, and he multiplies any wins from this spin by a random number between 2x and 15x. On the third spin, players will be treated to expanding wilds by Pogo, a flying horse covered in lightning bolts and bandages. More strangeness comes in spin number 4, where a dancing milk carton is picked to reveal a multiplier win of between 1x and 10x the triggering bet. Finally, if players have been awarded the maximum number of spins, they will see a character symbol turn up, who will turn all matching characters into extra wilds. This pokie is certainly different, but whether or not that’s a good thing depends on personal preference. The vibrant colours, fun animations and unconventional characters may not be to everyone’s taste, but even those who have never heard of Tokidoki can just enjoy the images and will certainly enjoy the bonus rounds. There’s a couple of problems here, however, notably in the minimum stake of 0.60 per spin, but also in the bonus rounds, where wins are very likely to occur, but not guaranteed, and anyone awarded just 1 or 2 free spins could end the round with little or nothing.